I know that many of the Blogger™ users out there are bored with default Blogger Templates which are pretty old and outdated. Most of the bloggers are using custom Blogger templates which look more professional and attractive. But now, we may have to change our decision and view on Blogger Templates because recently Blogger has announced the launch of Blogger Template Designer to Blogger in Draft, a big first step ever in improving Blogger template designs. In this post I’m going to tell what Blogger Template Designer is and how it helps you to become a better Blogger designer even though you have no background knowledge about editing XML codes. Before that, may be some of you don’t know what really Blogger in Draft is. Blogger in Draft is actually an experimental playground of Blogger™ where users can try out Blogger’s latest features. Recently, Blogger™ has launched Blogger Template Designer in Blogger in Draft which brings a new level of customization and design to your blog. Here, I’ve listed out some of the main features of Blogger Template Designer. 1. 17 new, customizable templates which are divided into 4 major groups, Simple, Picture Window, Awesome Inc, and Watermark. 2. Amazing hundreds of backgrounds images from istockphoto. 3. Modifiable color themes which matches your background images. 4. Layout options which are categorized into Body layout and Footer layout with one, two, three columns and adjustable width. 5. Advanced options which enable you to customize fonts, font colors, sizes and more. To try it, go to http://draft.blogger.com and log into it using your Blogger/Google account. Then, go to Layout > Template Designer. You will see a page where you can edit and customize the blogger template according to your taste. And here comes another best feature of it. In normal Blogger Layout option, we have to click preview button once we’ve edited the code, and wait until it loads, then if it contains some errors we have to bang our head to wall and search for the wrong code. But, in Blogger Template Designer, we can simply use a preview tool which automatically refreshes every time we make changes. All the templates in Blogger Template Designer are preset with tab designs. 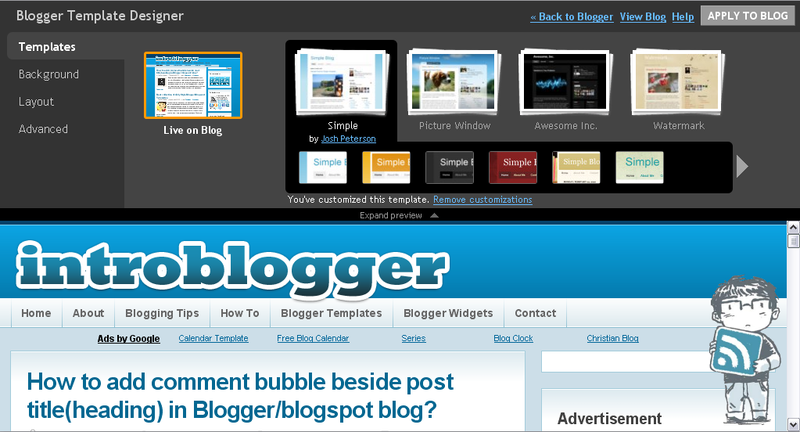 You can make navigation bars/ menu bars in your templates by using Blogger Pages feature. All the gadgets which can be previewed in the Blogger Template Designer page can be only moved. To add new gadget or delete a gadget you still have to go to Layout > Page Elements as in normal Blogger. The new blogger templates also come with Attribution gadget (added to the footer by all new templates) where copyrights are shown and credits for the background images and to designer are given. Sadly, the Blogger Templates Designer has some of it’s own disadvantages too. Blogger Template Designer is that it is not supported on IE 6. Rounded corners and drop shadows used in some of the templates may not be visible in older versions of some browsers. Here, I’ve attached a Youtube video about Blogger Template Designer which was released by Blogger. So, visit http://draft.blogger.com now and become a blogger template designer too. Happy trying. And if you liked this post, don’t forget to share it with your peers and subscribe to Introblogger Feed. Previous Post« Previous How to add comment bubble beside post title(heading) in Blogger/blogspot blog? I am too using new template designer.. it is much better than earlier one.. I really love the new template designer by Blogger. The design was the main reason for many people to refuse using Blogger. But, now no more excuses. Hahaha XD!! It would be better if Blogger introduce new Categories and tags system.